Take one look at Will Benson on a baseball field and you may think you’re looking at a big leaguer among high school athletes. Only Benson is 17 years old and graduating next year from The Westminster Schools in Atlanta, Georgia. The athletic outfielder was named to the 2015 Under Armour All-America Game and at 6’5″ and 225 pounds, put on an incredible power display during the players’ workout at the University of Illinois at Chicago last week in the Home Run Derby qualifying round. 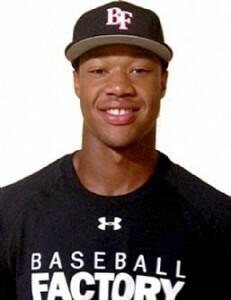 Benson, a Duke University commit who also has dreams of walking on and playing basketball for Coach Mike Krzyzewski at Duke, awed everyone in attendance, slugging 11 home runs to advance to the second round, coming dangerously close to the windows of dorm rooms in deep right field with his mighty blasts at the Home of the Flames. 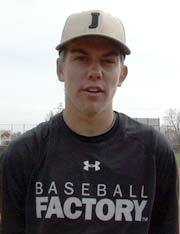 Baseball Factory caught up with Benson to talk about the All-America Game and more. Baseball Factory: You were the honorable mention All-State in hoops, we have heard you want to try and walk on at Duke to play basketball. What would the feeling be like if you made the team and got the chance to play for Coach K and the defending National Champions? Will Benson: It would be a blessing and not many people have done it before and so, if I made the team, I know I’m making history. It will just push me to work harder to be the best that I can be, and make history and help my family out. BF: Who do you model your game after in baseball and basketball? WB: It’s kind of funny, in terms of style of play and dominating the game and your opponent, it would have to be the mindset of Kobe Bryant. Kobe shows up, regardless of who you are and what event, even in the All-Star Game, Kobe is like, “I’m not here to play, I’m gonna drop 50 (points), and walk away”, and so I take that over to baseball; I’m gonna get my double, triple, home run, whatever and I’m going to make you question whether you want to keep playing the game. Physically, I watch Jason Heyward a lot, from the defensive end. He goes by the game so well, really good attitude and I’m really an attitude-type guy. Swinging wise, Miguel Cabrera because he’s so fluent and Chris Davis because he’s a big lefty like I am, and that swing is so money and powerful. BF: Who’s your favorite major league team? WB: The San Francisco Giants, just because the way they go about things. They’re always winning, when it comes to the postseason, they know what they have to do to get the job done. They come out on the field, let all the distractions go and they just dominate. BF: You’re going to be playing at Wrigley Field for the All-America Game, what are you feeling right now? WB: It’s a blessing. This is a day that I’ve been waiting for. Honestly, I didn’t even know this was as big and as great as it was. And on top of that, you get to play at Wrigley. It’s just icing on the cake. A dream come true, this is more than I even expected, to go lace them up and play on a professional field… its a blessing. WB: I was at my USA Tryout, things were going alright that day. I get back to my hosts house and she says, “Will, you had a call today.” And I thought, well it could have been from anyone, an advisor, anything small like that. And they told me Under Armour wants me to come to the All-America Game. I screamed. I was in my room shouting. I’m not the one to boast or tell anybody, so I didn’t tell anyone in my house, so they walked up to my room and asked if everything was ok and I told them I’m fine. We probably sat on the phone in silence for awhile…like this is real. I just made it. All my hard work is starting to pay off. And I can go play in such a great, well-known event and get some more exposure. BF: What’s one thing that you’re good at that most people wouldn’t know about you? WB: I can draw graffiti, and also I’m in an art class where we draw little things, I have a couple pieces with Superman. I also have a good grade in the class. BF: Which major league pitcher would you most want to hit a home run off of right now? WB: Who’s one of the hotter pitchers right now…? WB: Greinke. Throw him up there. I’ll hit a fastball. Maybe they’ll move me up in the lineup. BF: Do you want to be known as the next great two-sport athlete? WB: Yes, I do. I really do. But, let the chips fall where they may… but that would be amazing to make some history like that. BF: What’s the best thing about traveling around the country, playing with kids your age, making friends at events like this? WB: It’s another blessing. These guys are top-of-the-line, the best there is out there. Anyone can say, “well there are other games out there… other players who aren’t being seen”, well it doesn’t matter. I feel like even off the field that counts, because even off the field, we’ve created such a great bond with each other and to be around these guys and see how they go about their daily routines of getting better, kind of helps me out, see what I can add to myself. So to be around this much talent, elevates my game and I’m sure its the same for everyone else. I think its good you surround yourself with guys with different skill levels, so you can keep moving and keep working. I feel like everyone collectively has their mindset of going out there and having a good time but let’s go out here and work and I like to surround myself with that. BF: Sum up your All-America experience in a few words..
WB: The best event I’ve ever gone to. High-caliber coaches and it didn’t feel like a showcase, more a learning experience. The city was great, Wrigley Field is the best ballpark in baseball. It was awesome.